Thanks to its technological and commercial uses in the healthcare, pharmaceutical and cosmetic industry, collagen peptides (also named collagen hydrolysates) are an incredibly versatile protein that plays a major role for different internal processes in our organism. In this article, we will review all of the features and benefits of Collagen Peptides and what it can do for you. 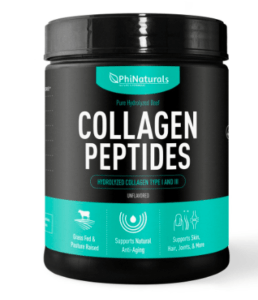 What are the Collagen Peptides? The Collagen Peptides are a great source of essential proteins, being an important element in order to have an efficient usage of the nutrients we take on a daily basis. Its nutritional properties are vital to foster proper health on our bones, joints and for the natural beauty of our skin. Collagen is made of three polypeptide sub-units called Alpha-Chains. They are intertwined to create triple-helix macromolecules. Collagen Peptides have a particular sequence of amino acids of unique size and structure. This type of sequence is necessary for Collagen to be shaped into small fibres that form an extracellular connective tissue of amazing strength that is part of our bones, muscle, joints, and skin. Due to its purity and neutral flavour, Collagen Peptides are fundamental for the development of functional food products, pharmaceutic solutions, and the cosmetic industry. Properties Collagen Peptides comes in a white, odorless and flavorless powder highly soluble in water or any other liquid (especially in cold liquids). They emulsify, form chains of foam, add consistency and agglutinate. Collagen Peptides are easily soluble in water, forming gels even in extremely concentrated solutions. Just like gelatin, Collagen Peptides are derived from Type 1 Collagen from a hydrolysis process. This same Collagen can be found in our bones and skin. Protein makes for up to 97% of Collagen Peptides. In its dry form, Collagen Peptides have 18 amino acids (8 of them, the so-called “Essential Amino Acids. Collagen Peptides. This special mix of amino acids adds to Collagen Peptides some of its most important functional properties for the health of your skin, fingernails, hair, bones, and joints. Collagen peptides have many applications in the healthcare, food industry and cosmetics. From healthy joints, strong bones, soft skin, silky-smooth hair, and healthy fingernails, Collagen Peptides are playing a major part in the maintenance of these fundamental components of our body. Besides, Collagen is one of the most abundant proteins in humans and animals. It is the first and most important structural protein of the conjunctive tissues. In order for you to keep strong, healthy and moving, it is needed just the right amount of Collagen Peptides in our daily diet. Red meat, porker, and chicken. Fish. Not only fish is rich on Collagen Peptides, but also in Omega-3, one of the healthiest fatty-acids you need. Salmon, white fish, and trout are highly recommended. Fruits and vegetables: Kale and broccoli have high levels of chlorophyll that your body later transforms into Collagen Peptides. Fruits like strawberries, cherries, raspberries, tomatoes, peppers and basically every red fruit you can think of are enablers for the internal synthesizing of Collagen Peptides in your organism. Also, oranges, pineapples, lemons, and fruits with Vitamin C stimulate the creation of natural Collagen in you. It is recommended a daily intake of 10 grams a day in order to have a positive effect on your bone, hair, joints, and fingernail. Bottomline As you can see, are an amazing and essential source of health benefits for you. The best part is you can obtain them just with a healthy and protein-rich food regime. However, if you feel like improving your intake of Collagen Peptides, don’t hesitate to consult a professional in order to obtain the proper advice based on your metabolism and particular needs.